RETHINKING LA - Several years ago, LA’s City Council committed to developing a Citywide Transportation Strategic Plan that would include a vision with goals and an action plan that clearly communicated to the city family the initiatives, priority projects and programs that the City should undertake. This plan would include performance goals for the city departments and strategies for implementation. An all-day City Council session that focused on Transportation took place, resulting in a flurry of motions that called for reports, lots of them, on ideas such as getting Transportation and Planning to work together and getting our funding strategies in order. The final list of motions, 25 in all, contained some ambitious references to innovations in transportation engineering as well as acknowledgements that business as usual in LA had to change. In the months that followed, the General Managers of Transportation and Planning appeared before the City Council to report on their progress, but they have since left the city, one under duress, the other in disgust. As for the Citywide Transportation Strategic Plan, it has been four years since the City Council dusted its hands of any responsibility for actually embracing a vision, instead commissioning another journey [link] that resulted in a report that states the obvious and avoids a commitment to change. This regional report from the Environmental Defense Fund and the Los Angeles County Economic Development Corporation came with 15 recommendations and serves as the substitute for the City of LA’s short-lived commitment to a Transportation Strategic Plan. The Vision LA report is quite nicely written and it identifies air quality, transportation, land use, employment, and housing as related elements. This is hardly a controversial position but it is also not a vision document for the City of LA. It is a statement of the obvious and an opportunity to dilute responsibility or any commitment to action. Three of the current Mayoral candidates were at the all-day City Council session that focused on the development of LA’s Transportation Strategic Plan. Where is LA’s Transportation Strategic Plan and what have you done to change the way the City of LA secures transportation funding, repairs and maintains its streets, rebuilds its broken sidewalks, supports innovations in traffic controls, improves safety on the streets, and pursues innovations in transportation? Under Eric Garcetti’s watch, the promised Bike Hubs at two Transit Oriented Developments never materialized, the rooms still sit empty as evidence of undelivered promises. Developers continue to make and break local hire and local delivery service agreements with the community. 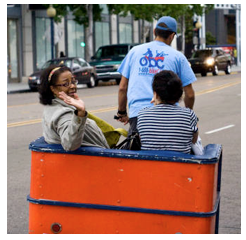 Under Jan Perry’s watch, a funded PediCab proposal died for lack of support, not from the community or from those who volunteered to make it happen, but from the Council office. The opportunity to turn LA’s transportation crisis into an environmental issue slipped by, demonstrating a clear commitment to business as usual. These are small examples of a larger problem. The three mayoral candidates have avoided stepping on each other’s toes and they have sidestepped opportunities to rock the boat, calling into question their individual abilities to serve as a change agent capable of moving LA forward. From addressing air quality on trucking corridors to reducing traffic congestion with regional valet services, the opportunity to change the current third world conditions of LA’s streets and sidewalks requires a commitment to the future. LA’s Transportation Strategic Plan was that promise but it turned into a busy agenda of motions that did not translate into any actions.